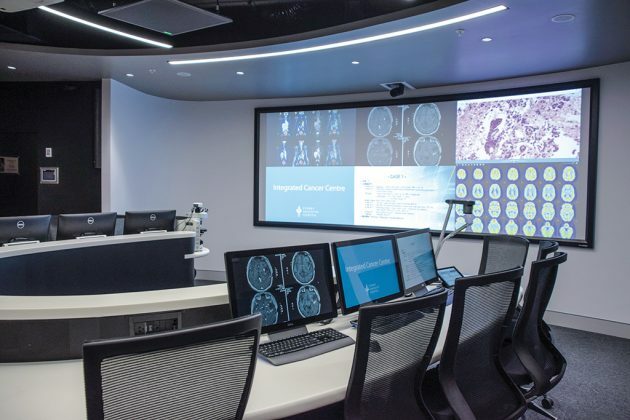 When Sydney Adventist Hospital were planning their new Integrated Cancer Centre, they realised the multi-disciplinary team (MDT) meeting room needed a combination of functions from a boardroom, video conference room and a teaching space. The “Cancer War Room” caters for up to 12 doctors and specialists contributing to the MDT meeting, as well as up to 40 observers, students and additional contributors for complex cases. The space is entirely “democratic” and participants have an equal voice. The room functions as a VC space, and multiple sources of content can be displayed simultaneously, in a variety of configurations on the big screen. The system is designed around an SVSI & Dante IP based solution for all audio, video and control routing. Where applicable, this is over the Sydney Adventist Hospital Network. 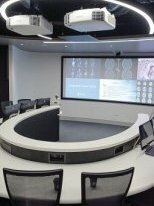 All of the inputs can be shared collaboratively across the Custom curved projection screen via a multi Window Video processor allowing 6 users to share and discuss content at any time.